Volunteers from Sirius planting trees. The tree planting forms part of Sirius Minerals’ one hundred-year, £175m planning commitment to enhance the local landscape and offset carbon emissions from its North Yorkshire polyhalite project. It is expected that 10 million new trees will be planted in total, creating more than 7,000 hectares of new woodland. Alasdair Fagan, Woodland Creation Officer for the NYMNPA, said: “In addition to off-setting carbon emissions from the mine development, these vast areas of new woodland will help to enhance the character and landscape of the National Park, together with creating more diverse wildlife habitats. 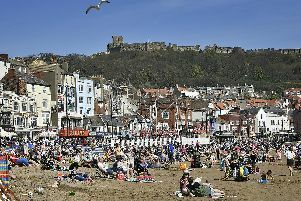 Since 2017, Sirius has provided over £4m to the National Park, North Yorkshire County Council and Redcar and Cleveland Borough Council, as part of its planning permissions, to projects that will protect and enhance the environment, develop jobs and skills, support tourism and increase local rail services. Briony Fox, Director of Conservation and Polyhalite Projects at NYMNPA, said: “Funding from Sirius has enabled us to commence our landscape and ecology programme, which has now supported a variety of projects in the area. Matt Parsons, External Affairs General Manager for Sirius said: “Our staff appreciate the National Park and it was great to spend the day planting over 100 trees. Click here to volunteer for the national park or call Joan Childs on 01439 772700.